National champions: The winning GCH junior men's cross country team (l-r): Eanna Folan, Michael Healy, Joe Tannian, James Frizzell, Thomas McStay, and Aaron Brennan. Harriers coach Matt Lockett has been appointed Irish U20 team coach for the European Cross Country Championships in Slovakia on December 10. Lockett is now regarded as one of the country’s top athletics coaches after completing a successful athletics career. Last weekend he led GCH’s junior squad to national success, as well as revitalising NUI Galway’s athletics team. 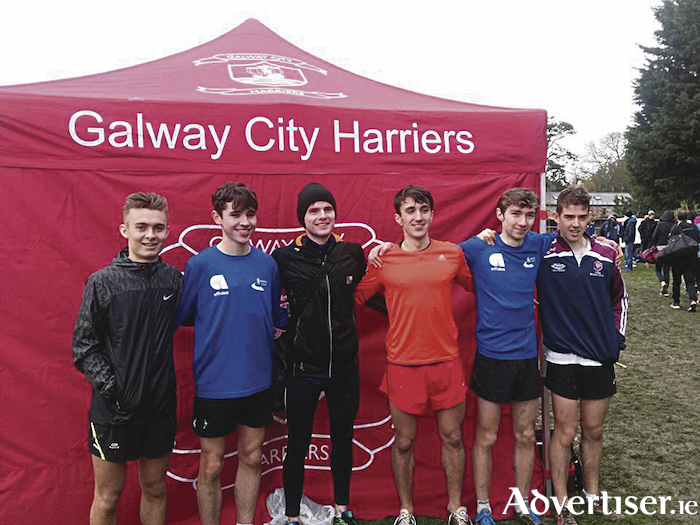 In an historic day for Galway City Harriers’ teams at the blue riband event of the cross country season, the junior men’s squad won the club's first national junior championship with a superb team performance. The U20 team, comprising Eanna Folan, who placed 13th, James Frizzell (15th ), Thomas McStay (16th ), Joe Tannian (27th ), Aaron Brennan (42nd ) and Michael Healy (88th ), produced a magnificent team effort to take the title. The team packed well together, with solid runs all round to beat off the challenge of holders Clonliffe Harriers of Dublin. As national U20 champions the team has now qualified to represent Ireland at the European Cross Country Championships in Portugal. The squad, coached to victory by Matt Lockett, deserves credit for building the junior squad in recent years. The U18 and U20 athletes competed together in the one race, and Thomas McStay finished in fifth place overall in the U18 category. GCH also took team gold in the U16 boys' race with strong runs from Barry Murphy, who placed 28th, Cillian Jordan (31st ), Alvaro Garcia Lara (35th ) and Eoghan Jennings (39th ), winning the event by just two points from Ennis. Up and coming GCH star Emma Moore ran a super race to win the individual bronze medal in the U14 girls' event, and now adds this medal to her national track 200m and 800m titles at both the indoor and outdoor National Championships, a superb set of achievements in one year. Isabella Burke finished 35th place overall in the same race. There were also good performances by Caron Ryan of Craughwell, 12th in the junior women’s race, and clubmate Sean Cotter, 15th in the U16 event. Tuam AC U12 boys squad just missed out on a team medal, placing a fine fourth club team overall. At senior level, Brendan McDonnell of GCH was first Galway athlete home in 28th place, leading the county team to fifth place overall in a highly competitive race. Next home for Galway were John Moroney of GCH, Ciaran Diviney (Crusaders ), Brian Furey (Rathfarnham ), Vincent McGuinness (Crusaders ), and GCH’s Michael Kerrin. Tuam AC club squad also competed, with Ian Egan, Paul Kearney, Sean Burke and Ger Hartnett their scorers, placing the club team 18th overall. Kathryn Casserly of GCH had a superb run to place 33rd in the senior and U23 women’s race for Galway, with Mags Kilkenny of Ballinasloe and Ciara Greene of Craughwell placing 72nd and 79th respectively.